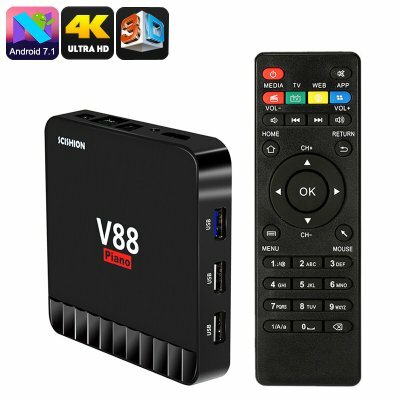 Successfully Added Scishion V88 Piano Android TV Box - Android 7.1, Quad-Core, 4GB RAM, 4K Support, 3D Media Support, Wi-Fi, Google Play to your Shopping Cart. Entertain friends and family with amazing movie nights thanks to the Scishion V88 Piano Android TV Box. This Android media player lets you play games, watch movies, and enjoy Android Apps straight from your big screen TV. It comes with Google Play and Kodi TV installed, meaning that you’ll have free access to millions of the latest media files. Thanks to its Android 7.1 operating system, a lag-free user experience is guaranteed. The Android TV Box treats you to 16GB internal storage and a 32GB SD card slot. This provides you with all the space you need to store your games, Apps, and files. With its Quad-Core processor at 1.5GHz and 4GB RAM, this Android TV box is capable of tackling the most demanding software features. Furthermore it supports 4K media files and 4K films to treat you to a true cinematic experience. To further increase your overall media experience, this Android Media Player supports Miracast for easy file sharing. Simply connect this Android TV box to your TV, and you’ll be able to enjoy your favorite films and series like never before. By supporting WiFi connectivity, the TV Box even lets you browse the web from your TV set. This allows you to download files, stream movies, or check social media. The Scishion V88 Piano Android TV Box comes with a 12 months warranty, brought to you by the leader in electronic devices as well as wholesale media players..